For my birthday last weekend, my husband Mason bought me a book I’d only seen mentioned on the internet. We were in the Wacko store in Hollywood and I missed it the first time I looked over the rack, but he sent me back to give the highlighted new books another look. That time, I picked up the book without even cracking its cover. I wanted it so strongly that my arms quivered as I clutched it to my chest. It’s called The Empire of Death: A Cultural History of Ossuaries and Charnel Houses. On its cover is an amazing photo of the bones of Saint Pancratius standing in gilded armor. Inside it’s so full of color photos that the book is really heavy. There are essays early charnel houses, the “Counter-Reformation Macabre,” “Spiritualism and Mythology in the Bone Pile,” and a chapter on “Ossuaries as Commemorative Sites,” which includes the skulls taken from Cambodia’s Killing Fields. I waited to page through the book until we got back to our host’s house. It’s filled on one amazing place after another. There were a lot I’ve visited — the Cappuchin catacombs of Rome, the Bone Chapel of Kutna Hora, the Paris ossuary — but I’ve never gotten so close to the bones or taken such lovely photos. There were so many, many places I haven’t yet had the opportunity to visit: the mummies of Guanajuato, the Cappuchin catacombs in Palermo, and the catacombs of the monastery of San Francisco in Lima, Peru. And all the places I’ve never heard of before: the Capela dos Ossos in Campo Maior (Portugal), the Crypt of St. Leonard’s Church in Hythe (which I didn’t realize was in England), the Chapel of Skills in Czermna, Poland. I was almost ill with envy that the author and photographer Paul Koudounaris had been able to take such a world-spanning journey to see so many lovely and thought-provoking things in person. Some of the photos were intense, even for me: the plague crucifix covered in running sores, the bug-eaten corpses in the Chiesa dei Morti in Urbania. I had a moment of vertigo as I tried to tally up all the skeletons displayed in these pictures. There are a lot of dead people in this world on display. There’s nothing like a memento mori to brighten a birthday. The Empire of Death is one of the best birthday presents I’ve ever gotten. 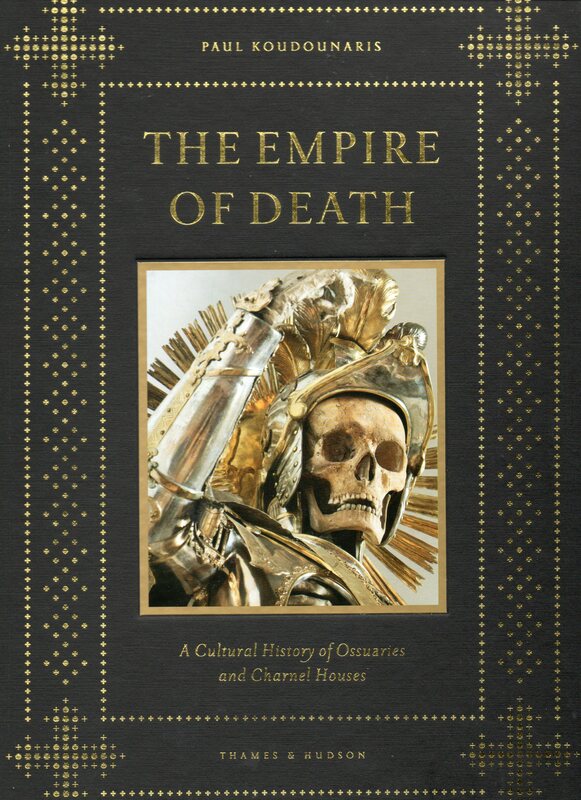 You can travel to LA to get your copy from Wacko, or you can order one from Amazon: The Empire of Death: A Cultural History of Ossuaries and Charnel Houses . This entry was posted in Cemetery book review and tagged bones, Capuchin catacombs, Kutna Hora, ossuary, Paris Catacombs, skeletons. Bookmark the permalink.